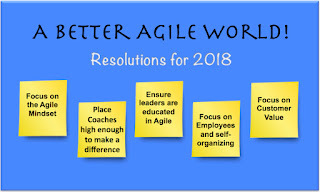 Top 5 ways to adapt your Agile Enterprise for a better Year ahead! A New Year is upon us! What is in store for 2018? Better yet, what changes might you apply for a better Agile transformation and better business outcomes? Here are a few to consider. 1) Focus more (much more) on the Agile mindset and the Agile values and principles. Without this, people aren’t quite sure whey they are implementing the Agile mechanics (practices and tools). Ask your employees if they know why they are applying the Agile methods and practices. If they don’t really know, more strongly relate them to the Agile values and principles. 2) Place Coaches high enough in to make a difference. Placing them too low in an organization will give them little or no influence to change anything that matters. Gauge your current placement of Agile Coaches and determine if they have the right access and influence to leadership. 3) Ensure leaders in your organization are educated in Agile. Provide a combination of the Agile values and principles and Agile concepts, mindset, and practices that will help them support and lead an Agile transformation. This includes understanding and establishing a high performing Agile workplace. 4) Focus on the employee side of Agile and what it takes to build a high performing team. This includes establishing psychological safety, demonstrating servant leadership, creating a culture of self-organizing teams and even self-management, introducing continuous peer-to-peer feedback loops, and more. 5) Become totally customer-value driven. Stop doing Agile for Agile’s sake and focus on the customer benefits. Bring a customer mindset to Agile. This means more closely identify with your customers (e.g., personas) and capture and apply more customer feedback along the way. 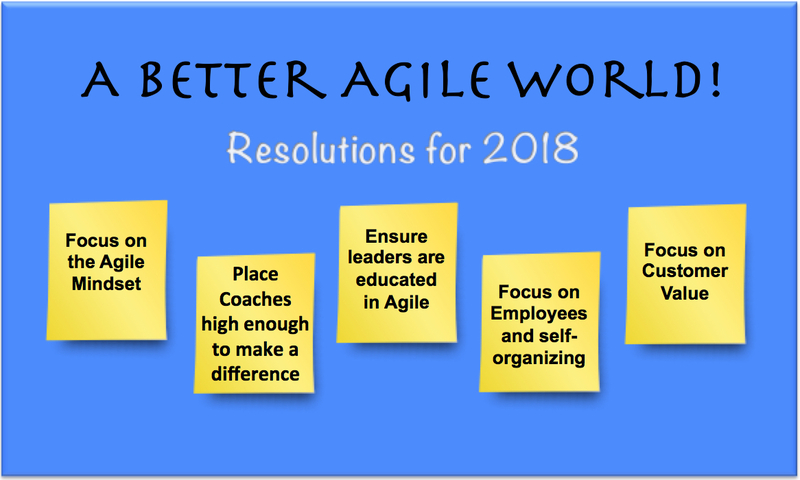 I will go so far to say if you don't do anything else this year but these, you will have a stronger Agile enterprise that brings you more aligned with building high value products and services. Give them a try! Learn more by reading The Agile Enterprise. 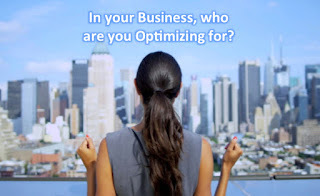 In your Business, what are you Optimizing for? Do you optimize for your customers or for the ease of following a plan or process? Many companies like to say that they optimize for their customers. However, upon a closer look, you catch the scent that some companies optimize for their own internal processes or plan instead. When you change the plan, it can disrupt schedules and make it less clear on what will be built for the release, as things tend to evolve. It will also force re-planning, which can impact dependencies and staffing of the work. One of the Agile values states “Individuals and interactions over processes and tools.” In other words, Agile advocates the importance of interactions with customer. One example of optimizing for a plan or process (instead of the customer) is purposefully avoiding customer feedback because it can force you to adjust the plan which can be messy. Another example that I’ve witnessed several times is when actual customer feedback is captured that indicates a change to customer needs, yet the feedback is ignored since sticking the plan is an easier path. This is a sign that the organization may be optimizing for their internal processes or the comfort of sticking to the initial plan. When paired with management objectives of sticking to a schedule, this often leads to a mindset of avoiding any change. Does this sound familiar? Be careful not to fall into this trap. It can be very easy to do. It can lead to losing touch with the customer and poor business results. When you optimize for the customer (external), it will often lead to change. One of the Agile principles states that you should “Welcome changing requirements”. The more you interact with your customers (which you should be doing), the more they will provide thoughts or feedback on what they really want. This, in turn, leads to adapting the plan to the great benefit of building something the customer wants. The net result is an increase in better business results. There are several ways to gauge if you are optimizing for the customer or for your internal plan or processes. A first way is to identify how often you actually engage with customers (and how many) in ceremonies like demos and sprint reviews. Engaging with many customers indicates you are optimizing for the customer while none or few indicates a leaning toward the internal plan. A second way is to capture how often you actually incorporate customer feedback. Methodically incorporating feedback indicates that you are optimizing for the customer while incorporating little feedback may indicate a leaning toward following the plan. 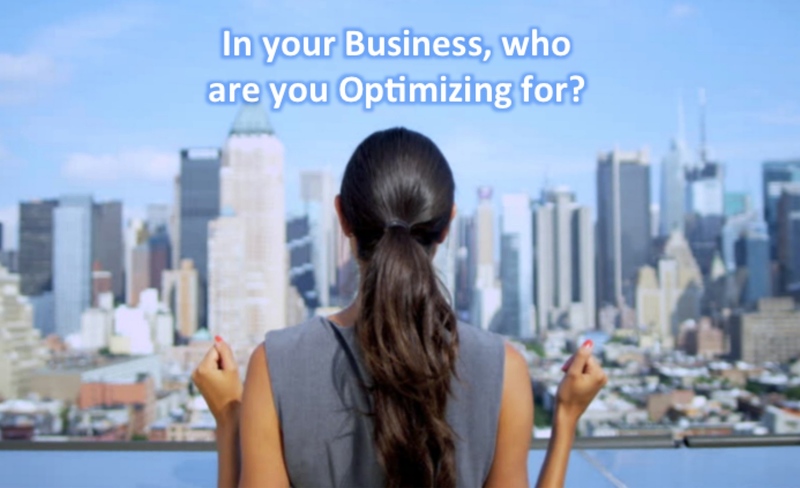 As you look around your project, product, or company, ask yourself, who are you optimizing for? Who should you be optimizing for?